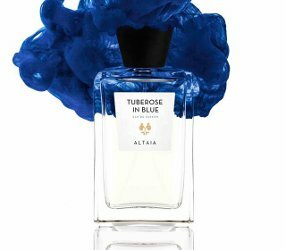 Marina Serale and Sebastián Alvarez Murena of Eau d'Italie have launched Tuberose in Blue, a new fragrance under the Altaia brand name. A stopover in balmy Rio de Janeiro during an Atlantic crossing from Argentina to Europe. On the Corcovado mountain, an old car gently ascends a narrow road through a swirl of cobalt-blue butterflies, the sweet scent of tuberose wafting in through the open windows. The notes feature mandarin, neroli, tuberose, freesia, heliotrope, cedar and sandalwood. Altaia Tuberose in Blue is available in 100 ml Eau de Parfum.